I actually think it is towelie, I liked him when the catch phrase 'wanna get high' was first published. But in the episode where he published the book, and oprahs cootch shot itself, he just lost his flavor. I hate Shelly! I just want her to be raped by Cthulhu! Nah, she'd like that, especially if Cartman is on board. The crab people annoy the piss out of me. The idea of Mr Hankey makes him a more worthwhile and tangeable character than the others, and hes fun to immitate. The theme song really ties the whole thing together, making him a valid character. The Jackovasaurus was just downright annoying. Im guessing hes modeld after JarJar ? Tweek. He annoys the sh*t out of me...JUST PUT DOWN THE GODDAMN COFFEE, AND GO GET SOME WATER. SERIOUSLY. And were his parents on crack when they named him? Tweek Tweak? I thought they were level headed people. 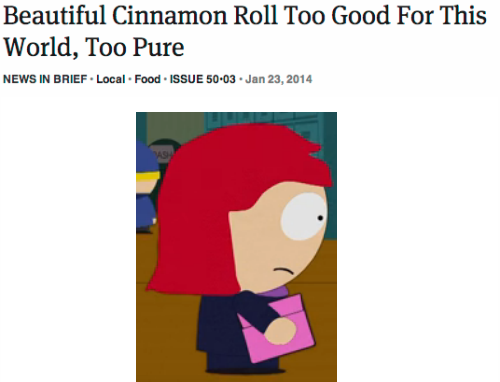 Episodes: Butters' Very Own Episode,Chreekoke Hair Tampons,and Kenny Dies. bailrocks123 wrote: Tweek. He annoys the sh*t out of me...JUST PUT DOWN THE GODDAMN COFFEE, AND GO GET SOME WATER. SERIOUSLY. And were his parents on crack when they named him? Tweek Tweak? I thought they were level headed people. Level-headed?! What show have you been watching? Judging from the "Child Abduction" episode, Tweek's parents are among the biggest freaks in town, second only to the Stotches. Duuuh. Last edited by VACOOLA on Wed Mar 06, 2013 7:05 am, edited 1 time in total. The Jackovosaurs episode was on last night and I had almost forgotten how annoying they were! Who the hell might vote for Mr Hankey? He's one of my favorite characters and not only mine!! !